Hello! Welcome to March. Felt like making a blog post today because it seems like I’ve been extremely productive this weekend. Unfortunately, my finger feels jammed from being hit yesterday with an air hockey puck (thanks, Mark) but I’ll endure it to type this out. The weekend started Friday I suppose, when my Perler bead order came in so I finished John’s seminole magnet. I also started recording my first sing-a-ma-jig video, so that’s exciting. I hope to finish that up tonight. I’ve been working on my charity quilt cross stitch square; this year I’m doing a screen shot from the pinball game Crystal Caliburn. I’m probably 2/3 done with that; another couple weeks left I think. Update: see the Sing-a-ma-jig video here! Saturday was the Day of Activity. Started out playing disc golf in the morning, wasn’t entirely terrible. It was foggy and damp when we started though, so my feet were completely soaked through within minutes. After coming home and drying out, we had a kickball practice in the afternoon, it was probably near 80 by that point, so all the moisture was gone. Last night, we went to lazer tag (thus the air hockey injury) but I did come back to win from a 6-2 deficit, so I’d say I came out ahead. I mention that it was 80 yesterday afternoon so that I can point out that it is now 27 with a wind chill of 15 at the same time of day. WTF, weather. 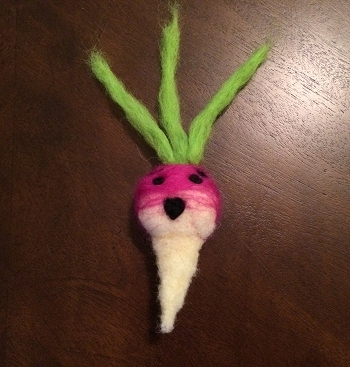 I also repaired Manoj’s dart board, baked cookies, got a Costco membership, and made a needle-felted turnip. Ooh! Ooh! And I just got a new Mac laptop! My old one died a few months ago, but I have put off biting the bullet and getting a new Mac since I didn’t think I really needed one, but now that I want to do more video editing, and learn Xcode for a new project, I finally got one and am super excited. Hm, I think that’s all. Time to go finish up the sing-a-ma-jig video, which I will share with you shortly!